This would be a perfect gift for your little Star Wars fan! 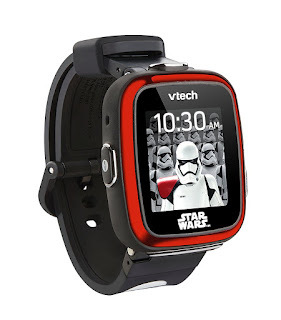 Head over to get this VTech Star Wars First Order Stormtrooper Smartwatch for ONLY $38.38 (Retail $59.99)! Explore your creativity with the First Order Stormtrooper Smartwatch. This durable smartwatch can take pictures and videos and includes Star War-themed photo effects. Padawans will love using the motion sensor to trigger Lightsaber, droid, and space ship sound effects. Challenge your skills with three mini activities that include blasting asteroids, escaping Stormtroopers and racing with BB-8. The watch helps teach kids how to tell time by letting them choose among 30 Star Wars-themed digital and analog clock faces. A voice recorder provides voice-changing effects so your child can sound like robot, change the pitch of their voice or slow it down. In addition to the alarm, timer and stopwatch, the smartwatch also includes a calendar feature and a calculator so your young Jedi can work out simple addition, subtraction, multiplication and division problems. Children will love exploring the galaxy with their First Order Stormtrooper Smartwatch.